The Titans, also known as the elder gods, ruled the earth before the Olympians overthrew them. The ruler of the Titans was Cronus who was killed by his son Zeus in an epic battle that lasted ten years. Most of the Titans fought with Cronus against Zeus and were punished by being banished to Tartarus. During their rule the Titans were associated with the various planets. Uranus is the sky god and first ruler. He is the son of Gaea, who created him without help. He then became the husband of Gaea and together they had many offspring, including twelve of the Titans. His rule ended when when Cronus, encouraged by Gaea, castrated him. He either died from the wound or withdrew from earth. Uranus (Ouranos) is the personification of the sky and the son and mate of Gaea. Their children are the Hecatonchires (Centimani), the Cyclopes and the Titans. Uranus was jealous of the future power of his children and feared he would lose his rulership to them. He threw his children in the underworld to prevent this. At the instigation of Gaia, her son Cronus castrated his father and dethroned him. When Uranus' blood fell upon the Earth (Gaea), the Erinyes (the goddesses of vengeance) and the Gigantes (giants) sprang forth, among many other divinities. Cronus was the ruling Titan who came to power by castrating his Father Uranus. His wife was Rhea. Their offspring were the first of the Olympians. To insure his safety Cronus ate each of the children as they were born. This worked until Rhea, unhappy at the loss of her children, tricked Cronus into swallowing a rock, instead of Zeus. When he grew up Zeus would revolt against Cronus and the other Titans, defeat them, and banish them to Tartarus in the underworld, killing his father with a thunderbolt. Yet, some say that Cronus managed to escape to Italy, where he ruled as Saturn. The period of his rule was said to be a golden age on earth, honored by the Saturnalia feast. Rhea was the wife of Cronus. Cronus made it a practice to swallow their children. To avoid this, Rhea tricked Cronus into swallowing a rock, saving her son Zeus, who grew up and deposed his father. In Greek mythology, Rhea is the mother of the gods, daughter of Uranus and Gaea. She is married to her brother Cronus and is the mother of Demeter, Hades, Hera, Hestia, Poseidon and Zeus. 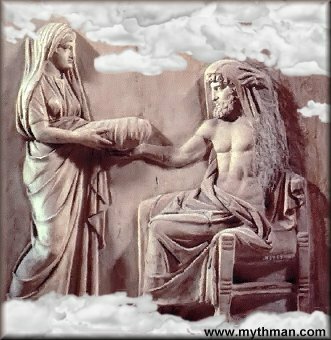 Cronus, jealous of the future power of his children and to secure his dominion, ate his own children but Rhea managed to rescue one son, Zeus. She hid him in the Dictean Cave in Crete and gave Cronus a stone wrapped in the clothes of the infant, which he swallowed. Thus Rhea succeeded in making him believe that he had killed all of his children. When Zeus reached maturity he overpowered and dethroned his father and made Cronus disgorge his siblings. Oceanus is the unending stream of water encircling the world. Together with his wife Tethys they produced the rivers and the three thousand ocean nymphs.He is the personification of the vast ocean. As geography became more precise, Oceanus began to refer to the water outside of the Pillars of Heracles, or the Atlantic Ocean. He was the eldest of the Titans and a son of Uranus and Gaia. He was the father of all rivers by his sister Tethys. The couple also had the Oceanids which personified springs and smaller bodies of waters, like lakes and ponds. Tethys is the wife of Oceanus. Together they produced the rivers and the three thousand ocean nymphs. She was the personification of the fertile ocean. She married her brother Oceanus and had over 3000 children by him: They were the springs, lakes and rivers of the world. Tethys was the god-mother of Rhea and raised her during the civil war between the Titans and the Olympians. Hyperion is the Titan of light, an early sun god. He is the son of Gaea and Uranus. He married his sister Theia. Their children were Helios (the sun), Selene (the moon), and Eos (the dawn). The name Hyperion means "he who goes before the sun" and may have arisen because he was sometimes thought of as the sun. Atlas was the son of Iapetus. Unlike his brothers Prometheus and Epimetheus, Atlas fought with the other Titans supporting Cronus against Zeus. 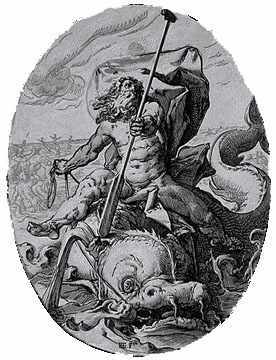 Due to Cronus's advance age Atlas lead the Titan's in battle. As a result he was singled out by Zeus for a special punishment and made to hold up the world on his back. Menemosyne is the personification of memory and its goddess. She is a daughter of Gaea and Uranus and the mother of the nine Muses by Zeus, her nephew. Themis was the Titan of justice and order. Themis is one of the daughters of Uranus and Gaea. She is the personification of divine right order of things as sanctioned by custom and law. She has oracular powers and it is said that she build the oracle at Delphi. By Zeus she is the mother of the Horae and the Moirae. Themis is depicted as a stern looking woman, blindfolded and holding a pair of scales and a cornucopia. The Romans called her Justitia. Her name means "Law". The Titaness Themis introduced the ordinances which concern the gods and instructed men in the ways of obedience to laws and peace. Themis delivered oracles at Delphi until Apollo, the lovely son of Leto, came to the city, killed the serpent Python, which guarded the oracle and, sitting in the tripod, took over it. However Leto did not give Apollo her breast when he was born; but Themis, who was there, poured Nectar and Ambrosia with her own hands for him to taste. Themis told the Titan Prometheus (who called her "mother", but so he called Gaia too, as some will have it that Gaia and Themis were one and the same) not to join the TITANS in their war against the OLYMPIANS, because as she prophesied, in that war, the clever, not the brute, would prevail. When Prometheus was punished by Zeus and bound to the Caucasian rock, Themis prophesied that a descendant of a Danaid (Heracles, Hercules), none of them yet born, would deliver him. Iapetus is the son Uranus and Gaia. 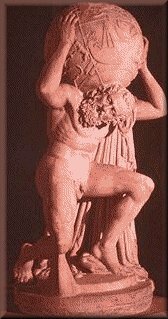 Iapetus' wife is Clymene, with whom he had four children - Atlas, Menoetius, Prometheus and Epimetheus. He is occasionally called the husband of Asia or Asopis. One of the Titans, Coeus was the father of Leto, husband of Phoebe and the grandfather of Apollo, Artemis and Asteria. His name means "Intelligent". Crius and his siblings were the children of Uranus (Sky) and Gaea (Earth). He had five brothers; Coeus, Cronus, Hyperion, Lapetus, Oceanus; and six sisters; Mnemosyne, Phoebe, Rhea, Tethys, Theia, and Themis. This bright and clear Titanian goddess, who shines down with soft light and bathes her lovely body in the waters of the Ocean, is the Moon. Her parents were Hyperion and Thea. Selene fell in love with the very handsome Endymion, who was allowed to choose what he would, and he chose to sleep for ever, remaining deathless and ageless. However some say that he chose to be always sleepless. Endymion's beauty was comparable only to that of Adonis, Ganymedes, Narcissus, Hermaphroditus, Hylas and Chrysippus. Because Helios (Sun) and his sister Selene (Moon) influence the temperature of the air, both pestilential diseases and deaths have been imputed to them. And then they have been associated with Apollo and Artemis, because these are healers, and standing for what is sound and safe, may prevent those diseases and deaths. Some say that it was Selene who nourished the Nemean lion which Heracles killed. Her offsping included fifty daughters and the handsome Narcissus. Phoebe is the Titan of the Moon. She is the daughter of Uranus and Gaia. She married her brother Coeus and with him she became the mother of Leto and Asteria. It is said that she owned the oracle of Delphi before Apollo took it over. Thea is a minor Greek goddess, one of the Titans. Her husband and brother is Hyperion with whom she had three children - Helios (the sun), Eos (the dawn) and Selene (the moon). Prometheus was the wisest Titan. His name means "forethought" and he was able to foretell the future. He was the son of Iapetus. When Zeus revolted against Cronus Prometheus deserted the other Titans and fought on Zeus side. 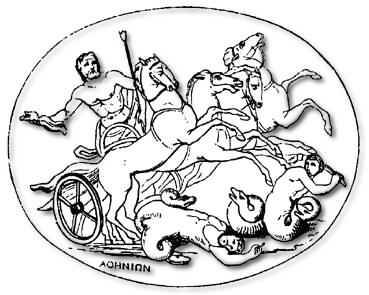 By some accounts he and his brother Epimetheus were delegated by Zeus to create animals and man. Since his brother had foolishly given most of the finer qualities to the animals, Prometheus had man walk upright to give him an advantage over the beasts. 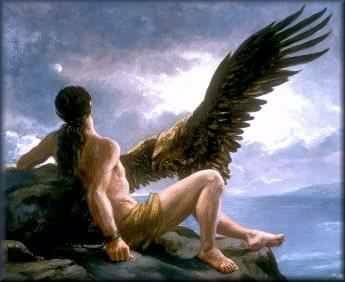 In all accounts, Prometheus is known as the protector and benefactor of man. He gave mankind a number of gifts including fire. He also tricked Zeus into allowing man to keep the best part of the animals sacrificed to the gods and to give the gods the worst parts. For this Zeus punished Prometheus by having him chained to a rock with an eagle tearing at his liver. He was to be left there for all eternity or until he agreed to disclose to Zeus which of Zeus children would try to replace him. He was eventually rescued by Heracles without giving in to Zeus. Epimetheus was a foolish Titan, whose name means "afterthought". He was the son of Iapetus. In some accounts he is delegated, along with his brother Prometheus by Zeus to create animals and mankind. He gave all the finer qualities to the animals, leaving little of use for humans. He also accepted the gift of Pandora from Zeus, which lead to the introduction of evil into the world. Metis presided over all wisdom and knowledge. She is a daughter of Oceanus and Tethys. Metis is regarded as the first wife of Zeus, whom he swallowed when he discovered that she was pregnant, fearing she might give birth to a son mightier than he. Subsequently, the goddess Athena sprang fully armed from his head. It was also Metis who delivered the remedy that made Cronus disgorge the children he had swallowed. Her name means "Wisdom". According to certain traditions, the goddess or Titaness Dione became by Zeus the mother of Aphrodite. Actually, her name is a feminine form of Zeus (dios). It means "Divine queen".